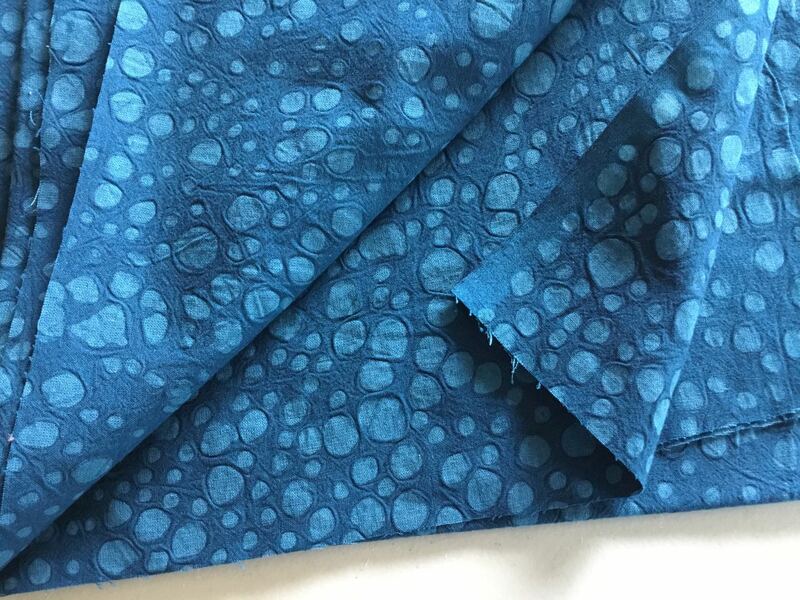 Have you heard of cotton embossed fabrics? Until about a year I go, I was not familiar with them. These cotton embossed fabrics are from Diamond Textiles and they are both beautiful and unique. Here are just a few of the colors from the full color palette that is available. The Cotton Embossed collection also includes black, white and natural in several different patterns. 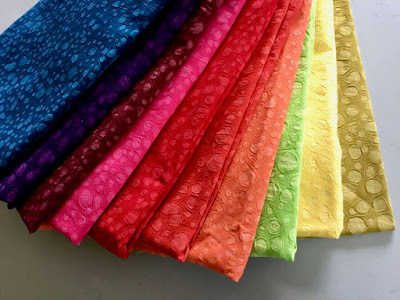 Selection of Embossed Cottons from Diamond Textiles. The colors and patterns on the embossed cotton fabrics are achieved through a batik resist dye process. The removal of the resist after the dye process creates the "embossed" or "debossed" areas (the dots in this example). Yes, you can actually feel the depression of the spots on the fabric. And, like the batiks that you're familiar with, the color is on both sides of the fabric. With embossed cottons, the color is on both sides of the fabric. I decided to give embossed cottons a try with appliqué. 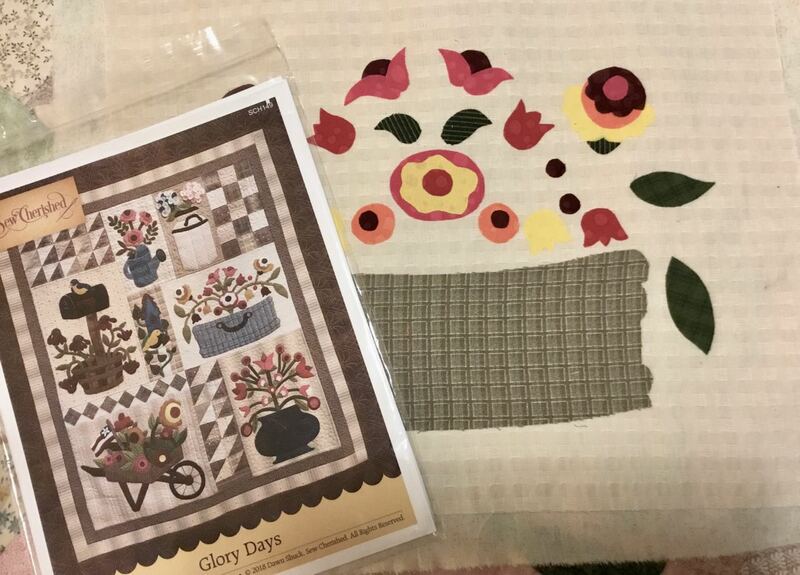 The pattern is a new one from Sew Cherished called, Glory Days. The scrappy patchwork blocks and the borders of this quilt are a lovely selection of yarn-dyed wovens from the Nikko collection—also from Diamond Textiles. 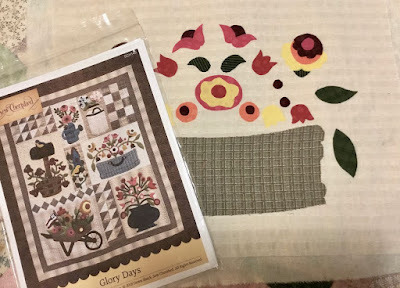 Glory Days pattern from Sew Cherished. I'm using a fusible appliqué technique (not turned edge) for my project and taking advantage of the inherent characteristic of the embossed cottons. 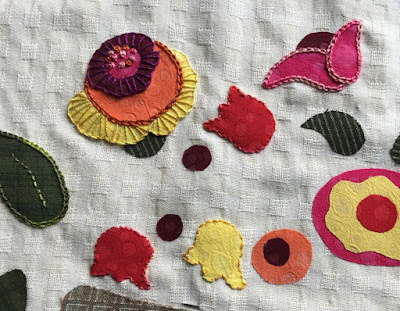 Because these fabrics are dyed and have color all the way through, this makes them perfect for fusible appliqué—no white edges! 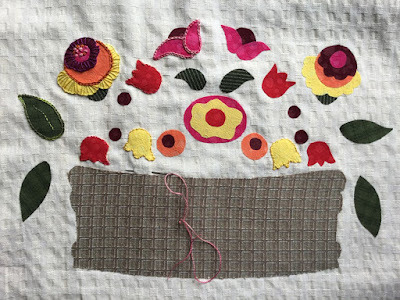 Fusible appliqué with hand embroidery. Since I'm enjoying hand stitching these days, I've chosen Eleganza from Wonderfil Threads—a #8 perle cotton that comes in a range of beautiful solids and variegated—to add hand embroidery and stitch embellishment to the appliqué. Here's the start of the stitching process. The background fabric is yarn-dyed woven [PRF-568] from the Primitive Collection by Diamond Textiles. This weekend ushered in Fall. I think I'll keep the colors of summer a little longer with this basket of flowers... brightly colored embossed cottons... and a bit of slow stitching.